As vehicle manufacturers the world over turn their attention to lightweighting, safe, luxurious and lightweight materials are essential factors as they, along with premium interiors, provide one of the biggest opportunities in the automotive industry. This means that suppliers will have to come up with solutions that not only help OEMs meet continually tightening regulations but also satisfy the widening range of consumers’ personal tastes. Furthermore, there is focus on enhancing the driver’s experience with personalised interiors. - The constant demand for fuel-efficient vehicles, mainly to reduce weight, which reduces running costs and fuel consumption, has resulted in the penetration of plastic composites into the automotive sector due to their lightness and stiffness. 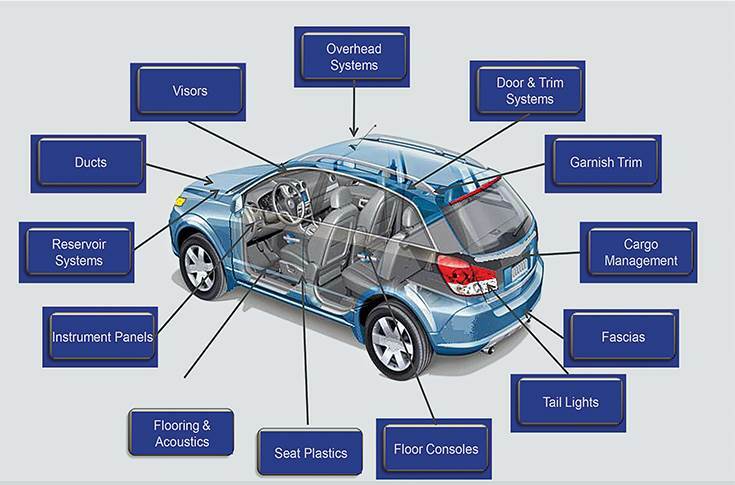 - The introduction of new models with more varied and extensive usage of composites in the period 2015-2020 will substantially increase the production of composites for automotive applications. Quality has always been the cornerstone of any industry to succeed and grow. It is now understood that customers are willing to pay a premium for a good-quality product. In the future, much of measurable quality will become hygiene and we will be driven to higher standards by perceived quality. The same brings in the need to understand the elements in the vehicles that affect our senses. This includes HMI, infotainment, lighting effects, customer-perceived quality parameters, colours, materials and even the processes. There is a constant demand and pressure from OEMs to look at lighter alternatives for reducing component weight. The use of plastics is likely to grow as OEMs aim to reduce prices as well as look at reducing costs. However, this would need more innovation at the suppliers’ end as they look to develop products that can replace metal parts. The areas in a four-wheeler where components made of plastics are being increasingly used to reduce vehicle weight. With composites and with favorable strength-to-weight ratios, plastics now account for almost 50 percent of the volume of a vehicle. However, they account for only about 10 percent of the overall vehicle weight. The main goal is the reduction of mass of the motorcar. The order of the day is that technology has to reduce the weight of the vehicles, and the move would be towards using more plastic components as well as aluminium to help in weight reduction. And with increased awareness towards cleaner environment, better utilisation of existing resources and stringent emission norms, we shall continue to see an upward trend in terms of usage of plastics and other lightweight materials in the years to come. CO2 emissions – environmental regulations for low CO2 emissions and fuel efficiency in the EU and the US dictate more fuel efficient vehicles from 2015 onwards. In the EU, the 2015 target for fleet average CO2 emissions of 130g/km and the 2020 target for 95g/km aim to reduce the average vehicle CO2 emission by 18 percent and 40 percent from 2017 respectively. OEM fleet vehicle average will need to achieve 95g/km by 2021 and CAFÉ standard for fleet average of 54.5 mpg by 2025. OEMs have to deal with the high cost of some automotive composites, especially carbon fibre where difficulties in repairing and recycling prevents its penetration into the high-volume medium and low-end car segments where cost is of the essence. While parts made of ferrous metal contribute about 68 percent of total vehicle weight, plastic parts account for about nine percent of the same. Additionally, the current low-volume production due to existing production techniques and a lack of general engineering experience, results in a higher manufacturing cycle and prevents investments from OEMs. 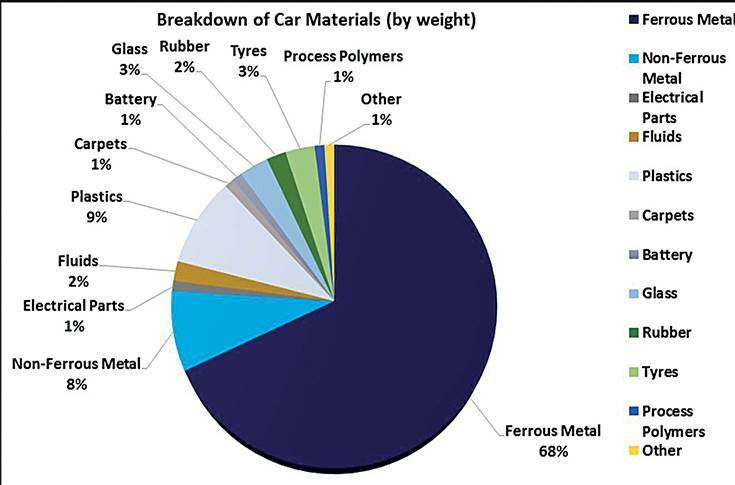 Last but not the least, the strong position of steel companies in the automotive sector as the main suppliers of car body, engine and drivetrain materials, in conjunction with existing heavy investment from auto manufacturers into metal production lines, prevents the easy substitution of metal with composites. The introduction of recycling and repairing processes from the increased engineering experience, accompanied with the improvement of the economic climate, which will enable further investments in automotive composites, will enable growth drivers to overcome the effect of the opposed restraints. A typical breakdown of classification of parts illustrated below shows the average use of plastics and with increasing design requirements and challenges in weight, a lot of system modules are being designed and integrated with lightweight components. Interior dashboard and cockpit system: With increasing demand for lightweighting, the need for a modular structure, hybrid beams, insert moulded plastic reinforcement beams and lightweight magnesium alloy concepts have become design and manufacturing prevalent in most upcoming automotive applications. 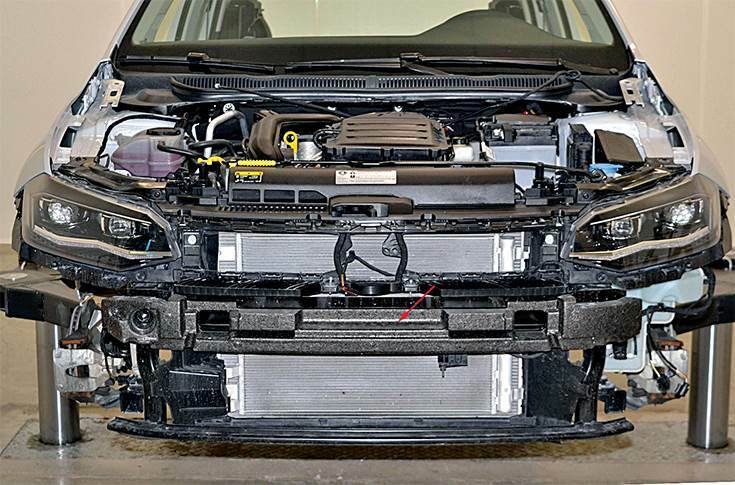 Vehicle front end module: Modular front end structures made of composite plastics help to reduce significant weight and create flexible design solutions. Passenger airbag modules: Replacing the typical steel door with light weight thermoplastic TPE doors with integrated hinges. We are constantly engineering and designing products with exciting solutions all the time to work towards bringing new innovative products that are lighter in weight and make for environmental-friendly interior solutions. Sustainability is paramount in all that IAC does. IAC’s processes and products help reduce environmental impact with recyclable materials, supporting efficient manufacturing. FiberFrame, an environmentally sustainable, lightweight and natural fibre sunroof frame, offers up to 50 percent weight savings over steel frames. With the increasing popularity of sunroofs and panoramic roofs in passenger cars across segments, the team has been inspired to develop new lightweight concepts. We have developed stiff and lightweight concepts, which help realise different fixation concepts on the car body, the sunroof or the panoramic roof module. 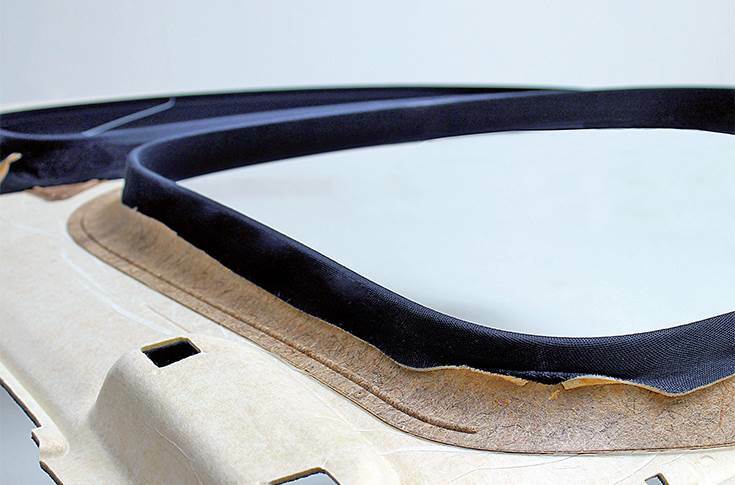 FiberFrame, an environmentally sustainable, lightweight and natural fibre sunroof frame was produced. IAC’s FiberFrame replaces the sunroof’s metal reinforcement frame with a lighter frame employing strong, natural fibres using a new raw material comprised of 70 percent renewable content. we follow our strategy and expansion of vertical integration of our interior systems. IAC has developed another innovative process patented as HybridFleece Moulding. This is a unique process for combining the pressing of a thermoplastic mixed fibre fleece from a natural fibre, glass or recycled carbon fibre with the moulding of stiffening ribs and clips into a one-step process in the same moulding tool with no need for additional welding or glueing. 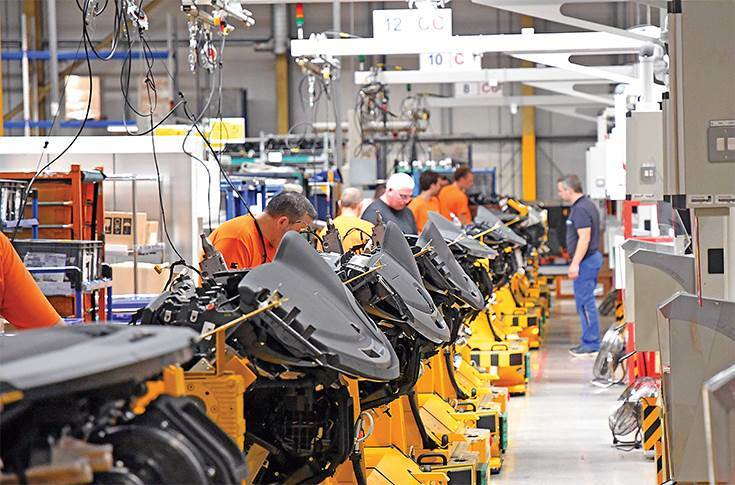 IAC's Halewood plant features a flexible, just-in-time cockpit assembly line for several passenger vehicle models. The process allows for significant weight savings in vehicle interiors. The technology can be used to produce a variety of lightweight structural and visible (A-surface) interior components and is designed to reduce process complexity. Lightweight design and electrified powertrain have become important strategies in the automotive industry to reduce fuel demand and break down emissions respectively. Lightweighting of electric vehicles (EVs) is considered a step forward because advantages of both EVs and lightweight design could be combined to reduce environmental impacts even further. The increased demand for electric and hybrid vehicles in which composites' usage for lightweighting is of essence, has turned automakers' focus to lightweight composite materials as a substitute for heavier steel and iron in all types of vehicles.